Welcome to Food Vacuum Sealer Instructions. 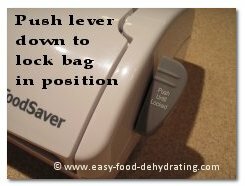 Here we show you how to PROPERLY PLACE your vacuum-sealer bags on the FoodSaver! 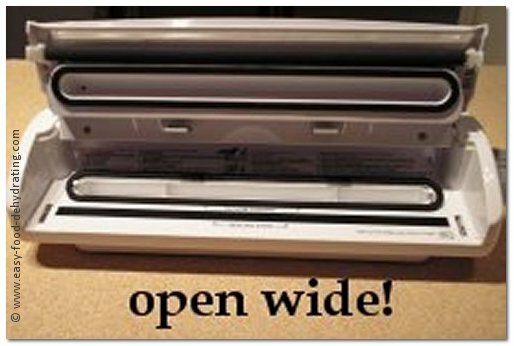 This photo shows you WHERE TO PLACE the CUT EDGE of your vacuum sealer bag. The edge of the bag goes right in the center of the black oval vacuum channel. Hold the bag in place with your hands away from the area, then close the lid. Press the lever down that's on the right side of the machine. This holds the bag in place (see photo below ad). While the bag is clamped, I smooth out the contents of the bag, making it pretty flat. This makes it much easier to store in the Mylar bags later on. Now, simply press the dark "vacuum and seal" button. You'll now experience the air being drawn out of the bag, and this lasts about 6-10 seconds! When the vacuuming is finished, you'll see the machine switch over to the "seal" mode — and the seal button will light up in red as shown in the photo. Let the machine seal the bag and be patient! This takes about 6 seconds. When you see the light go off, you can now raise the handle which locks the lid in place, and lift the lid and retrieve the vacuumed and sealed bag! Simply place the edge of your Mylar bag beyond the first dark strip (as shown in the first photo on this page) — about an inch is good. Take a look at the 'open wide' photo and you'll see the dark rectangular strip on the bottom, just in front of the oval vacuum-sealer channel. This strip works in conjunction with the upper bar. The lower strip will be flush against the bag's bottom when the lid is closed. Just press the SEAL button this time, and your bag will be sealed without any vacuuming taking place! As the top bar heats up when the lid is down, the heated bar works to seal the bag. Write On Bag's Contents and Add The Date Too! I use a black felt-tipped pen and spend this 'waiting time' writing the bag's contents and the date on the very top of the bag (above the seal) that I've just vacuumed. Thanks for taking time to read our food vacuum sealer instructions; remember, this is part 2. Part one of our food vacuum sealer instructions can be found here. sent in recently. I echo his words. in effect sealing it twice as a safety measure. Sometimes bags puncture during storage, or the seal may fail. Remember to rotate your stock and check for any 'soft' bags." 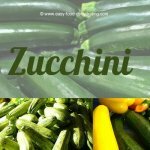 – Thanks for writing in Paul!